With longer nights during winter, it does not mean I'll be sleeping that much longer each night. When the conditions are good I like to take advantage of it by going outside to take night pictures. It was a cold night, but it was clear and the wind was calm. I stayed out until it was too cold, come back with few good pictures. Few nights back the temperature was minus 30 degree celsius and the forecast was for the winds to pick up and take the temperature to minus 41. Perfect time for night photography. I put on as many layers as I could and then headed out. The plan was to take 16 thirty seconds consecutive exposures, then return home and combine them all together with the magic of software to create star trails. With first quarter of the moon out, not all the stars were going to be visible, which was what I wanted. What was a nice surprise were the low clouds, they add to the mood. After setting up the equipment and taking few test shots. I let the camera handle the rest while I did my best to stay warm by dancing in the dark. I should have called it a night after the last image, but I decided to play around more with few different locations and shots before heading home as the winds started to pick up. 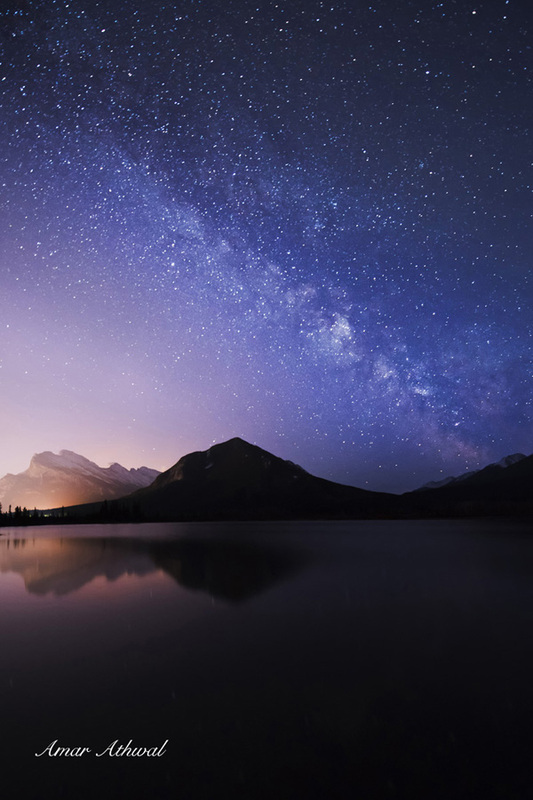 After watching a beautiful sunset at Peyto lake, I then decided to sit down among the rocks and watch the sky get darker and the stars make an appearance. 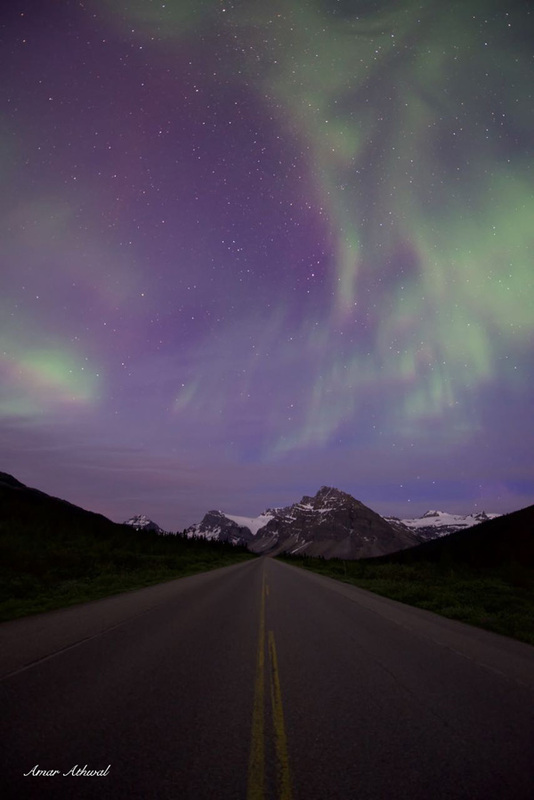 Only sounds I could hear as the brighter stars were making their appearance, was of the vehicles when they would go over the rumble strips on the road in the distance, the water making its way down from Peyto Glacier and more then likely a pika moving among the rocks near me in the dark. I was still able to see some of the warm colours from the setting sun in the distance, in the clouds and in the fire smoke from the west. 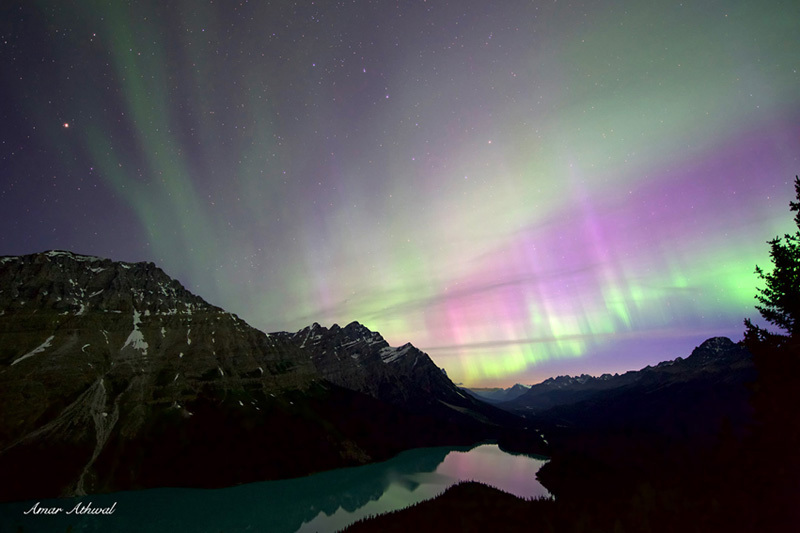 In the sky I could also see a glow, just a hint of northern lights. Once my camera had taken the pictures I had planned, I packed up and and made my way to the car. Half way there, a small owl flew front of me. Nice way to end the trip. It was a calm night, not too cold, stayed out there for over an hour watching the night sky and taking pictures. 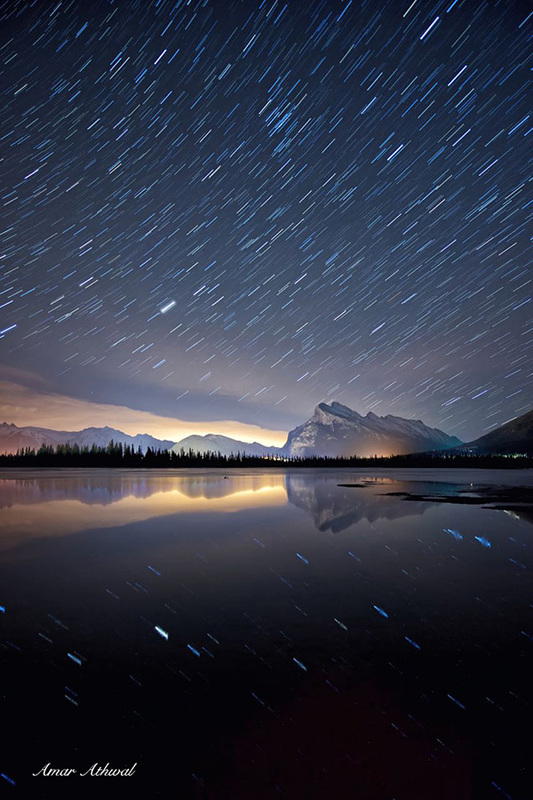 After the eyes became accustomed to the darkness, that's when the sky lights up with the stars. I was hoping to catch the Northern Lights, but the bright moon light played a role keeping the lights intensity down. Instead I came back with a night picture of Mount Rundle and Fairholme Rage lit up by the moon and a bonus, Jupiter in the night sky. Starting to take advantages of shorter days to get out and take pictures of nightscapes. 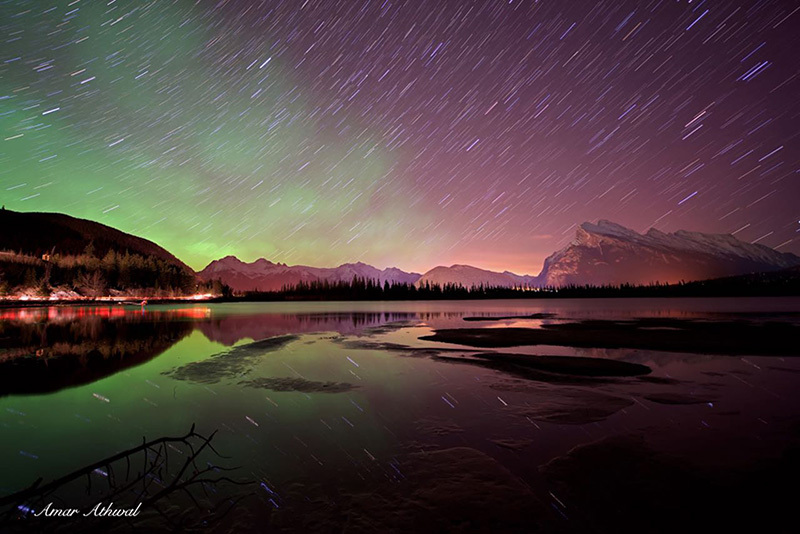 Here is one of Mount Rundle under star trails. No luck with a picture of the meteor shower, but had some luck with star trails pictures. I was taking 15 second long pictures, hoping to catch one or two images with meteors. I got to see several but none made the frame of my pictures. So I decided to combine the 15 second images to make the one posted. I was watching the Lunar Eclipse taking place when I looked toward my right. As the Earth's shadow started to cover the moon, I was starting to see the Milky Way. I had to modify my plans of just taking the pictures of the eclipse, our galaxy was coming into play. The darker it got the better I was able to see it, so after taking few pictures of the eclipse, I moved over twenty meters and grabbed few 30 seconds images of the Milky Way going over the town of Banff. 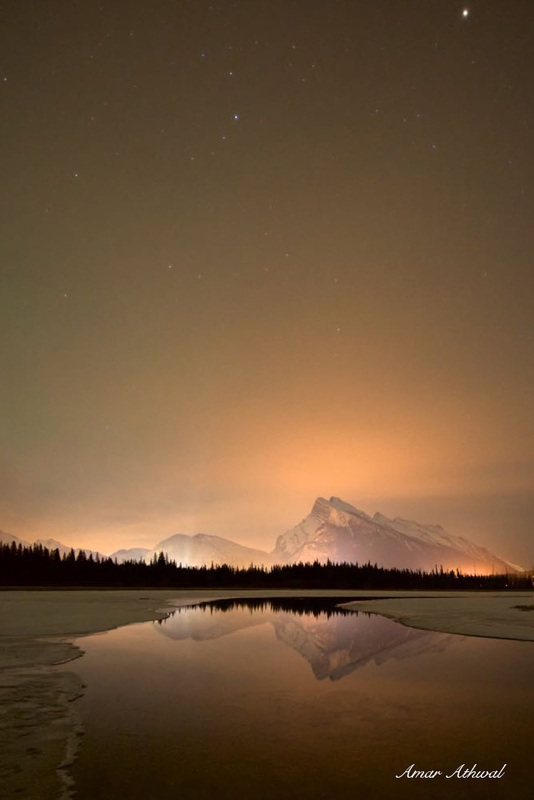 Mount Rundle at night from the other week. Did not get to get out at night as much as I had hoped, but the few times I did I was happy with the result. The ice I was standing on and also what you see is no longer there, the warm weather has taken it away. Which will provide other opportunities for picture taking, always have to adapt to the changes. One time or another we all looked up toward the dark sky and tried to count the stars. Growing up in the city you would think there are not many, the city lights making it difficult except for the bright ones to be seen. 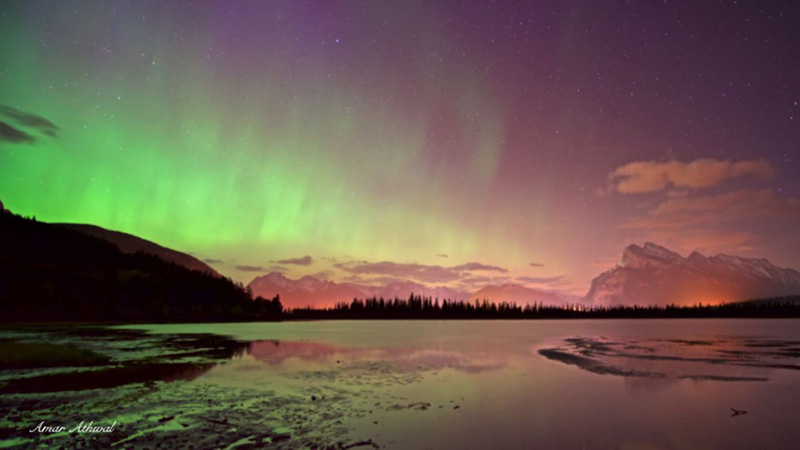 Here in the Banff National Park all that changed, there seems to be no end to how many can be seen on a clear dark night. Just in our galaxy the Milky Way along a conservative estimate is that are at least hundred billion stars. Beyond Milky Way there are at least hundred billion more galaxies, that's lot of fingers needed to count them all. It was a surreal feel to the night, thanks to bit of a fog and low clouds in the valley. The lights from the town doing their part lighting up the surrounding. 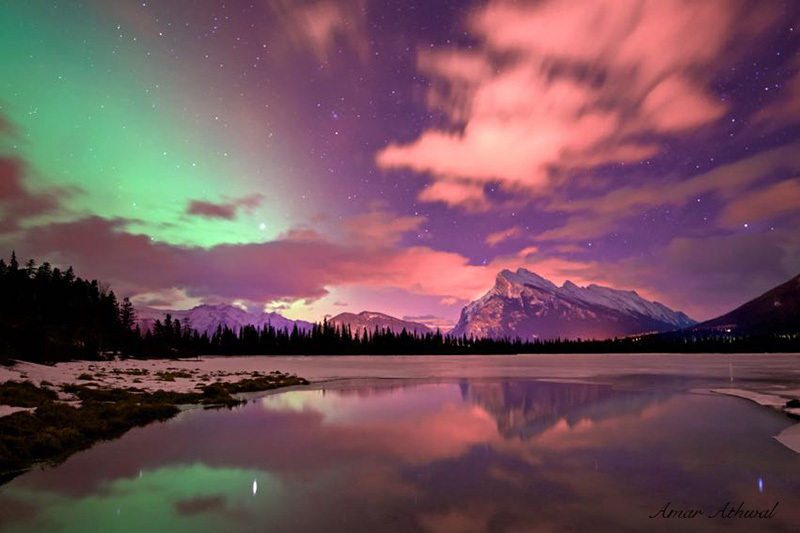 And throw in a bit of Northern Lights colour, it all added to a dramatic look and feel.